Dr. Uva de Aragón reviews the book, coordinated by Dr. Carmelo Mesa-Lago, on small independent businesses in Cuba, presented by CRI at Books in Books in Coral Gables. Valentina La Rosa, a graduate student from the University of Bologna, will conduct research on the linguistic attitudes of Cubans in Miami. The Miami Herald reports on the growing number of Puerto Ricans who are moving to Florida, due to the lingering economic crisis on the Island. CRI Director Jorge Duany discusses the implications of changing U.S. policy toward Cuban migration. The Sun Sentinel reports on the end of the special status of Cubans without visas who were allowed to stay if they arrived on U.S. soil. Dr. Jorge Duany will analyze recent changes in U.S. policy toward Cuba and assess possible scenarios under the new Trump administration. Read about our recent and upcoming public events in our newsletter. El Nuevo Herald highlights some of the main themes of the Eleventh Conference in Cuban and Cuban-American Studies, including the economic and political changes that have taken place in U.S.-Cuba relations since December 17, 2014. FIU historian Michael J. Bustamante shares his ideas about reading and teaching about the Island's history before and after 1959. Vicky Jassey, a Ph.D. candidate at Cardiff and Exeter Universities in the United Kingdom, will conduct research on gender and batá drumming in Cuba, with a particular focus on the burgeoning role of women batá drummers. Dr. Jorge Duany will lecture about the evolving relationship between the Cuban diaspora in Florida and Cuba. The conference will consist of 45 panels with more tan 200 presentations by scholars and students from throughout the United States and other countries. The Cuban Research Institute continues its tradition of convening scholars and other persons interested in the study of Cuba and Cuban Americans. The main theme of the 2017 conference will be "Beyond Perpetual Antagonism: Reimagining U.S.-Cuba Relations." Dr. Jorge Duany will speak about the transnational landscapes of Cuban Miami at the Fourth Annual Graduate Student Conference of the Department of Spanish and Portuguese Studies. CRI in the News: "Cubans Trying to Reach America by Sea Despite Change in U.S. Policy"
The U.S. Coast Guard said it intercepted 65 Cubans trying to reach Florida or Puerto Rico since January 12, when former President Barack Obama ended the "wet foot, dry foot" policy. Santa Fe College and Florida International University's Kimberly Green Latin American and Caribbean Center hosted their second annual faculty seminar on how Donald Trump's presidency might impact U.S. Latin American relations. The topics under discussion included immigration and security, U.S. manufacturing and international trade, and the future of U.S./Cuba relations. CRI in the News: "US Drastically Cuts Visas for Cuban Visitors"
Telemundo 51 reports that the number of nonimmigrant visas given to Cuban citizens dropped from 22,797 in 2015 to 12,218 in 2016. CRI in the News: "Celia Cruz Will Return to Cuba"
The Spanish newspaper "El País" interviews music collector Cristóbal Díaz Ayala during CRI's most recent conference in Cuban and Cuban-American studies. The conference was dedicated to the collector in recognition of his numerous contributions to the preservation, study, and promotion of Cuban music. The annual Miami conference organized by Hotel Opportunities Latin America and the Caribbean Hotel & Resort Investment Summit featured a special session on the current situation in Cuba. Fair Observer interviewed CRI Director Jorge Duany on the possible changes in U.S. policy toward Cuba under the Trump administration. C-SPAN Video on "Tourism in Cuba"
View the FIU panel discussion among academics and the authors of a recent report about Cuba's tourist industry, sponsored by the Brookings Institution and the Kimberly Green Latin American and Caribbean Center. The second issue of the online journal "Beyond the Sugar Curtain" focuses on "Mobility and Immobility." "Así somos en Miami | This Is What We're Like in Miami"
Our Visiting Fulbright Scholar, Petra Kuivala, reflects on her year of fieldwork in Miami. 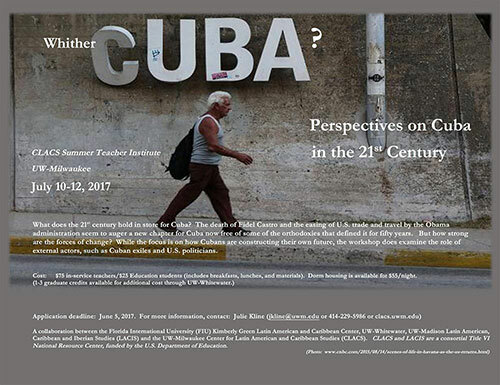 In collaboration with the Center for Latin American and Caribbean Studies of the University of Wisconsin at Milwaukee, FIU's Kimberly Green Latin American and Caribbean Center will hold a K-16 Summer Teacher Institute, featuring several FIU experts on Cuba. Alberto Sosa Cabanas will conduct research on the literary and artistic representations of blackness in Cuba from the end of the 18th century to the period before the Cuban Revolution. Visiting Scholar Vicky Jassey has inaugurated a digital archival project documenting Afro-Cuban drumming practices. Taught by Dr. Jorge Duany, this course will examine the culture of contemporary Cuba, with emphasis on the Cuban Republic, the transformations associated with the 1959 Revolution, the impact of international relations, and transnational Cuban communities. Jennifer Cearns, a Ph.D. candidate in Anthropology at the University College London, will conduct ethnographic fieldwork on the Cuban diaspora in Miami and its digital and material sharing practices with Havana. The Cuban Research Institute (CRI) is pleased to announce the competition for the 2017 Eliana Rivero Research Scholarship in Cuban Studies. The scholarship provides one FIU graduate student the opportunity to conduct research in Cuban studies—with special emphasis in the humanities—for one week in Cuba. Dr. Michael Bustamante will teach an undergraduate history class that will consider how the Cuban Revolution came to power, the consequences for the Cuban people, and the current situation on the Island. FIU News talks to Professor Emeritus of Art History Juan A. Martínez, a leading scholar on Cuban and Cuban-American art. Dr. Martínez was honored at a conference on Cuban art hosted by CRI on June 23. Together with Claudia Millán and Ada Ferrer, CRI Faculty Affiliate Iveris Martínez reflects on how growing up in West New York, NJ, shaped her scholarly projects. Professor Michael Bustamante assesses the consequences of undoing the U.S. rapprochement with Cuba. Who Wins and Who Loses with Trump's New Norms Toward Cuba? In an interview with CNN en Español, CRI Director Dr. Jorge Duany analyzes the recent changes in U.S. policy toward Cuba, announced by President Trump in Miami. In an interview with the Los Angeles Times, CRI Associate Director Sebastián Arcos argues that the changes announced by President Trump "are not a cancellation of Obama's policy." Check out the preliminary program of the annual conference of the Association for the Study of the Cuban Economy (ASCE) in Miami on July 27-29, 2017. Professor Michael J. Bustamante provides a well-grounded analysis of the current status of U.S.-Cuba relations and their impact on ordinary Cuban citizens. In February 2017, a group of FIU students established a new student organization to support both academic and social initiatives related to Cuban and Cuban-American culture. Dr. Jorge Duany will talk about "The Last Wave: The Cuban Diaspora during the 'Wet Foot/Dry Foot' Policy, 1995–2017," at the conference "A Hundred Years of Migration (1917–2017): Stories of Caribbean Exile and Diaspora," sponsored by Indiana University. The Society of Professional Journalists in Florida recognized Dr. Nora Gámez Torres as the Spanish-language journalist of the year for her coverage of Cuba. Sputnik News interviews CRI Director Dr. Jorge Duany on the second anniversary of the restoration of diplomatic ties between Washington and Havana. CRI Associate Director Sebastián Arcos participated in a panel discussion on travel to the island nation and the future of relations between the United States and Cuba. Latina Style Magazine has recognized CRI Faculty Affiliate Dr. Iveris Martínez as one of 12 leading Hispanic women from South Florida. CRI Director Jorge Duany analyzes the complex and diverse history of the Cuban diaspora between 1959 and 2017. PantherNow reports that members of the FIU community disagree over the effectiveness of President Donald Trump's recently announced U.S.-Cuba policy and its effect on the island's economy. The collection, which includes Cuban masters such as Wifredo Lam, Cundo Bermúdez, Rafael Soriano, and Humberto Calzada, will be exhibited from September 23, 2017, to January 3, 2018. A group of Cuban-American community leaders has stepped forward to support an initiative that will harness FIU's prestigious scholarly and cultural resources to activate its extensive Cuban collections for scholars and the public. Since January 2017, the Cuban Research Institute has sponsored or cosponsored 38 events to promote Cuban and Cuban-American Studies. CRI Associate Director Sebastián Arcos discusses Cuba's past, present, and future with blogger Anthony Lacey. The University of South Florida at Sarasota-Manatee has convened a panel of leading experts to discuss the state and outlook of U.S.-Cuba relations, including CRI Director Jorge Duany. A Ph.D. candidate in anthropology at the University College London, Jennifer Cearns will explore the material and digital links between Cubans in Miami and on the Island. CRI organized a presentation of Dr. Sharon Milagro Marshall's book, "Tell My Mother I Gone to Cuba: Stories of Early Twentieth-Century Migration from Barbados," at Books & Books on September 27. This meeting brought together renowned scholars from the social sciences and the humanities and policy experts to study the long-term effects of migration, exile, and diaspora cultures on the Caribbean as well as the United States and Canada. Valentina La Rosa earned her Ph.D. in Foreign Language and Communication at the University of Bologna, with a thesis on "Linguistic Perception and Attitudes toward Spanish and English by Bilingual Cuban Speakers." Dr. Jorge Duany estimated the magnitude of Puerto Rico's recent exodus to the United States, particularly to Florida, as a result of the ongoing economic downturn, and assessed the multiple effects of population loss in Puerto Rico. Leandro Travieso, a former José Antonio Echeverría scholar and FIU graduate, will join the 160 volunteers in the northern African country. CRI in the News: "How the Cuban Migration Story Is Changing"
NPR's Radio Ambulante broadcast a panel discussion on shifting patterns of Cuban migration to the United States, including host Daniel Alarcón, producer Luis Trelles, CRI Director Jorge Duany, and El Nuevo Herald reporter Nora Gámez Torres. The German-American illustrator Anna Veltfort recounts how she discovered love, her sexual orientation, and also unbearable harassment in Havana during the first years of the Revolution in a graphic novel, which she presented in Miami. Dr. Jorge Duany will form part of a team of three scholars who will evaluate the Latin American Studies Program at Pomona College, as part of its academic self-study. Drs. Elaine Acosta González, Anna Kaganiec-Kamieńska, and Consuelo Reyes Martínez will conduct individual research projects while affiliated with the Cuban Research Institute. Humberto Calzada's house is the ideal Cuban house or, better still, the idealized memory of the building that gathers the essence of the island's colonial architecture. Acclaimed novelist, playwright, and journalist Vanessa García explains why she writes, and why she writes about Cuba. CRI Faculty Affiliate Dr. Michael Bustamante assesses the chilling effects of the "sonic attacks" on U.S. diplomats in Havana on U.S.-Cuba relations. The highly-acclaimed poet, essayist, and memoirist Richard Blanco, is this semester's Betsy-FIU Exile Studies Scholar/Writer-in-Residence. The Cuban Research Institute will be the academic pillar of CasaCuba, a home for all things Cuban at FIU. Estibaliz Santamaría Cadaval, a Ph.D. student in Musicology at the Universidad Complutense de Madrid in Spain, will study the musical and social aspects of the Galician exodus to Cuba. Like Cubans 37 years ago, Puerto Ricans are arriving massively in the United States, particularly in the state of Florida. El Nuevo Día cites CRI Director Jorge Duany on the similarities and differences between the two migrant flows. WUFT interviews Drs. Jorge Duany and Michael J. Bustamante on the impact of the recent "sonic attacks" on U.S.-Cuba relations and Cuban migration patterns. Telemundo reports on Jennifer Cearns' lecture on the digital distribution network that connects Cubans in Miami and on the island. Dr. Jorge Duany will assess the impact of Puerto Rico's economic crisis on migration to the United States, particularly to Florida, as well as the prospects of an even larger population displacement after hurricane María. The ensemble Música Eterna will perform the Havana premiere of Dr. Orlando Jacinto Garcia's work "Asimetrías" for string orchestra. The José Antonio Echeverría Foundation has awarded its scholarship to Pedro Camacho, an FIU undergraduate student in history. A review of our last Classically Cuban concert, in memory of saxophonist Carlos Averhoff, Sr. The Mexican news agency, Notimex, reports on the impact of the so-called sonic attacks on the future of U.S.-Cuba relations. Panel Discussion | Cuba and the Caribbean: What Now? The Global Interdependence Center, the University of South Florida Sarasota-Manatee, and the Federal Reserve Bank of Atlanta will gather leading experts to discuss the state of U.S.-Cuba relations and the outlook going forward. The National Association of Cuban-American Educators awarded its annual prize to CRI Faculty Affiliate Dr. Pedro J. Greer, Jr.
Hatzel Vela holds the unique distinction of serving as the first local South Florida TV reporter to be stationed in Cuba. The Cuban Research Institute announces that the 2018 summer program for independent Cuban business owners has been canceled, due to the suspension of consular activities at the U.S. Embassy in Havana. FIU News interviews Carlos Averhoff, Jr., who led the Classically Cuban jazz concert in memory of his father.